Just a quick reminder that the next softball and baseball meeting is Monday! Softball will be first and baseball to follow immediately thereafter. Classroom G-2 is located near the athletic office. Enter the main West entrance near the swimming pool and walk down the hallway past room G-1 and past the trophy on your right. Classroom G-2 is immediately behind the trophy case. Another excellent opportunity to get better during the offseason! Many of you have been asking and now the classroom dates have been secured. This is a 5 month camp – field work will mostly be done June, July and August Saturday mornings. 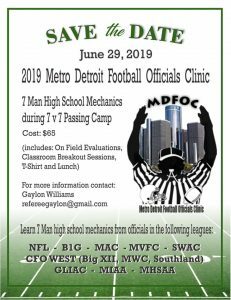 We will also be on the football field and cover proper coin toss and field mechanics for every position and every scenario. Please contact Kendall Sherman to sign up! Just a quick reminder that the next softball and baseball meeting is tonight! MHSAA baseball/softball exams are due April 18th. Please visit Correct Call and Purchase Officials for all your equipment needs. Our website is updated with the most recent softball and baseball information! Recently there has been a large number of fights between teams resulting in ejections and forfeits. Please take the time to review this information before you may need it. Click the hyperlinks to access the documents. They are also posted on our website under the ‘Basketball’ tab. MHSAA Point of Emphasis – New point of emphasis from the MHSAA explaining the procedure for officials when a fight occurs. MHSAA Report Writing Guide – Document with tips and screenshots to help us write clear and accurate reports. Consequences of Fighting Tool – Unofficial visual tool helps explain the application of rules after a fight occurs. Remember that reports are mandatory and non-negotiable after a fight or disqualification that result from unsportsmanlike behavior. 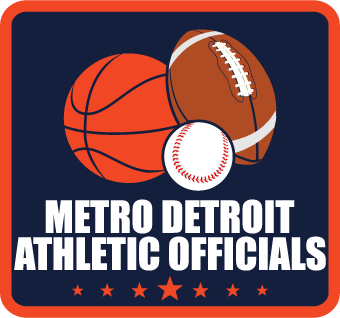 Reach out to us at metrodetroitathleticofficials@gmail.com or other officials if you need help writing a report after an incident. Don’t forget reports of ‘Praise’ can also be submitted using the same system to recognize schools for sportsmanship and hospitality. As we leave 2018 behind us and look forward to 2019, let’s hope we don’t need to face any more of these unfortunate situations. But we must be prepared to apply the rules accurately and consistently should a fight occur in one of our contests. Click to review the new official MHSAA Apparel Guide. It’s a clear guide that has plenty of visual examples to help us be consistent with uniform regulations. It is also available on our MDAO website under Basketball and Tips. Don’t forget to login to www.mhsaa.com and complete the basketball officials exam and the rules meeting if you have not done so already. Seriously, go do it now! As the season moves along, please email us at metrodetroitathleticofficials@gmail.com with any rules interpretation questions or interesting plays. Good luck and have fun in your upcoming games! Don’t forget to come review the test with us and other reminders for this basketball season!